This following cake was a first for me... 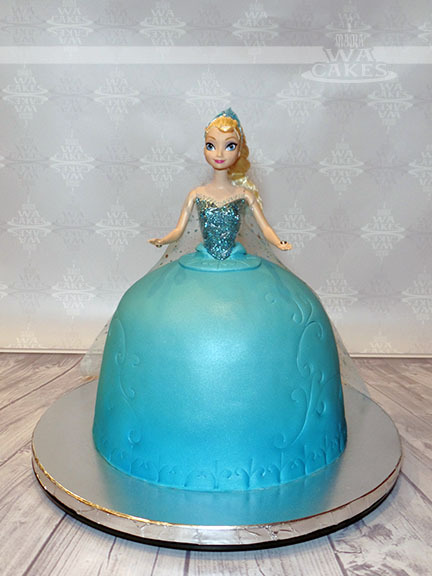 I've never had the opportunity to make a princess dress cake for anyone before. What better than make my first one as Elsa from Disney's Frozen! The first step was to figure out how tall the doll was and how big the cake would have to be to feed the expected number of guests. 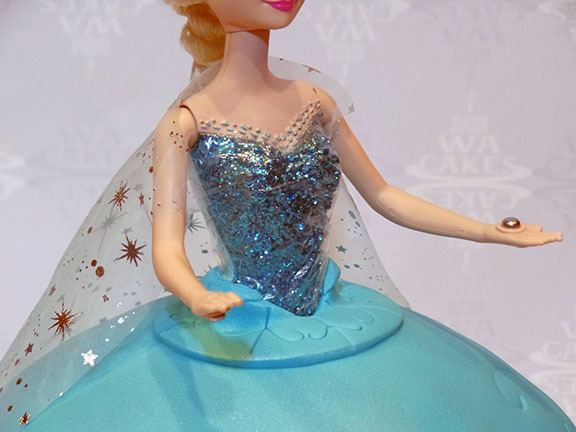 After much research, I came across the Disney Frozen Musical Magic Elsa doll. She was the perfect height for an 7" in tall cake. First step is to prep the doll. I removed her original dress and wrapped her legs and hair in plastic wrap to keep them clean. Since glitter is molded into the bodice, I used a strip of scotch tape and removed any excess glitter, and strategically wrapped her in plastic wrap. This is to protect the cake from any glitter that might fall. I then figured out the sizes and height of my cake versus the height of the doll. Her hip to feet measured 7", hence the height of the cake. Then the width of the cake was determined by the width of the doll. I wanted to make sure the proportions didn't look strange... didn't want her to look like she was drowning in a dress, but still had enough to serve. The top of the dress was baked in a oven-safe glass bowl, yielding the the general shape and size I needed. 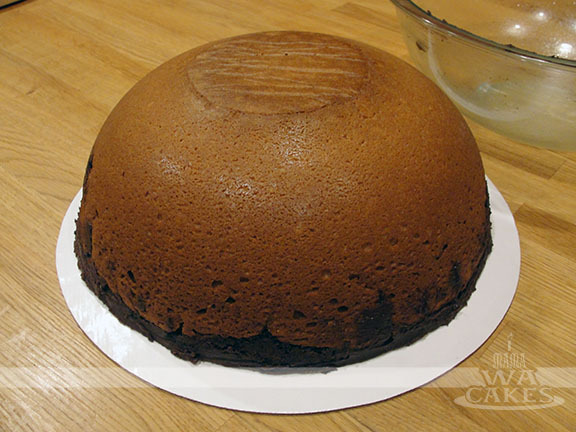 The rest of the cake was constructed out of a 9" and 10" round cake. These layers were baked and cooled completely prior to stacking. Once stacked, I slowly carved for a smoother dress shape, tapering a bit to her waist. I then cut out a cavity for her legs. 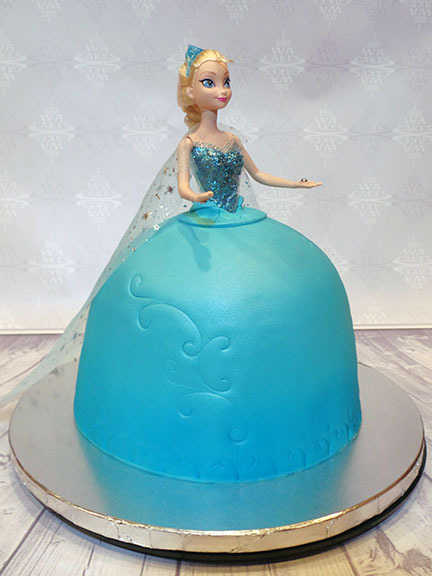 Once happy with the shape, I crumb coated the cake, and covered the cake in an ice blue fondant. 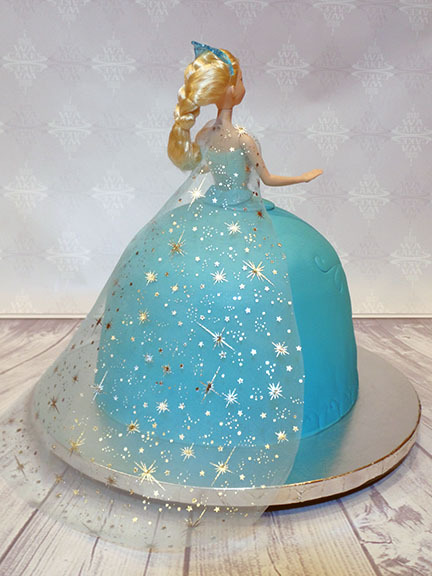 Elsa was then carefully placed into the cake, and I finished off the opening. I then stamped the cake with various Wilton decoration stencils to create a swirled motif along the bottom, and flowing up the sides. 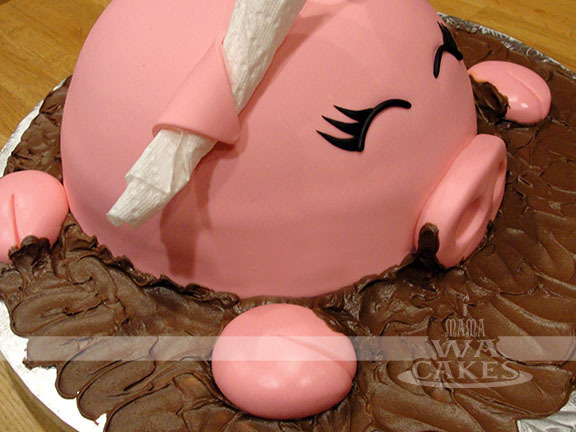 Be careful when doing this to not break through the fondant. Since Elsa's dress has an icy gradation, I air brushed the entire dress area in a pearl sheen, and blending in a darker blue sheen towards the bottom of her dress. For her cape, I opted for a printed mesh fabric that matched perfectly, color and motif. I made sure the sparkles were not simply glued on... Who wants glitter all over there cake?! oh, and I washed it prior to cutting out the desired shape. I simply cut two arm holes near the tapered top and slipped her arms through it. The finished look was perfect! Did I mention she lights up?!!! You can view the cake in action here! 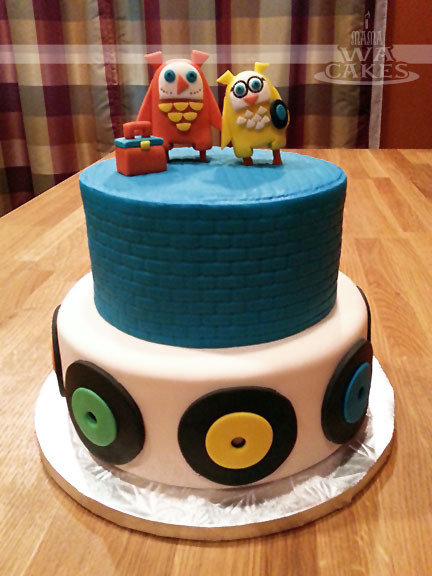 Last month, I had the pleasure of creating an adorable cake for my sister's friend... It was her little girl's 1st birthday! When she told me what she wanted, I was excited and quickly began brain storming. 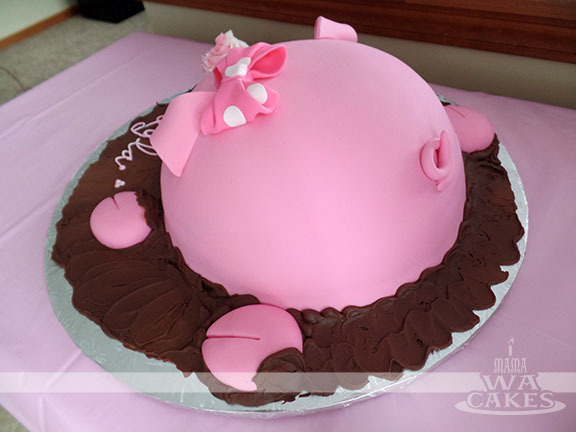 Normally, I would bake a series of cakes, stack them, and carve it to the desired shape. This process takes quite a bit of time, and creates quite a mess. However, for this cake, I found use of a kitchen item that I've had for years. And it can be found in most households... an oven safe glass bowl! 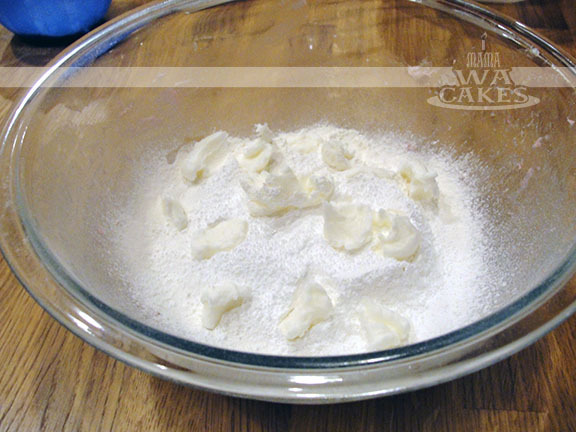 I used a 4 qrt mixing bowl, and made sure it was nicely coated with baking spray. 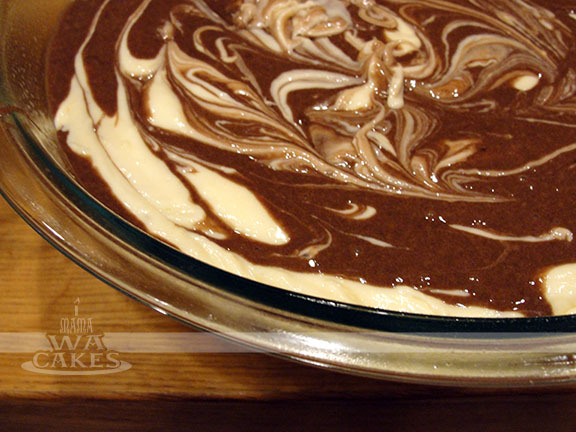 I poured the vanilla cake batter into half of the bowl, and carefully added dollops of chocolate cake batter. I then poured in the remaining vanilla batter and more chocolate dollops. Using a long skewer, I carefully swirled the two batters together to create a marbled cake. With a cake this big, I preheated the oven to only 325 degrees instead of 350. Baking it at a lower temperature, will ensure that the cake will done all the way through, without drying or burning the outer parts. Of course, the bake time will be longer than normal. 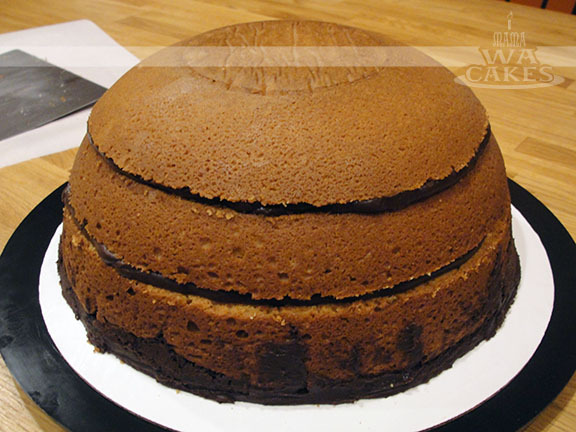 After the cake is baked and cooled completely, I leveled and torted the cake into 3 layers. To level a cake like this, the easiest way is to run a knife long the top of the bowl and keeping it straight until cut completely through. The layers were then filled with strawberry preserve, and crumb coated with buttercream. 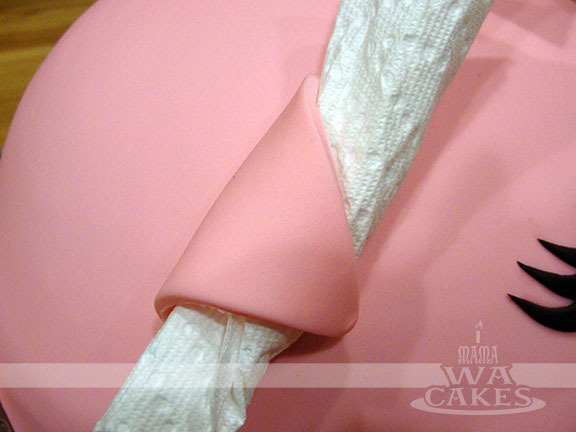 A blanket of pink fondant was then draped over the cake, and smoothed out by hand. For the distinct piggy nose, I created a large rectangle with rounded corners and indented the nostrils with a large ball tool. I then attached it to the cake with the help of some piping gel. 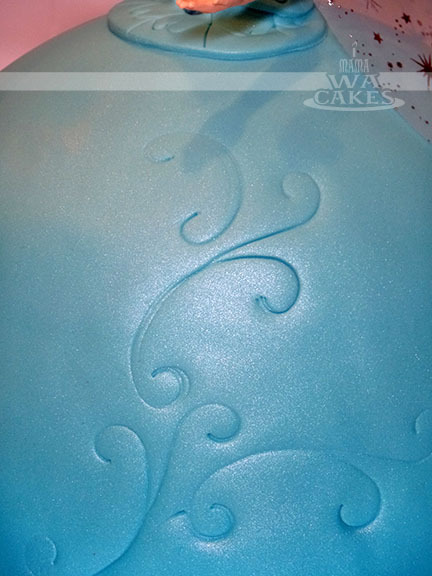 I prefer to use piping gel or royal icing for large pieces like this, instead of water, for the holding power. 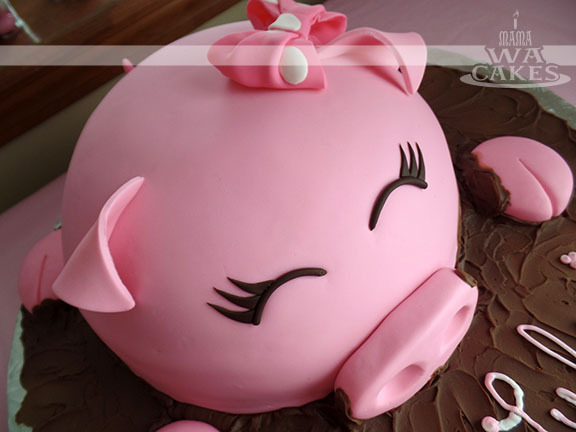 The same goes for the piggy feet that I simply shaped out of balls of pink fondant. The ears were then created with the help of a large triangle cookie cutter. I attached them to the cake with a touch of water, and draped it over rolled up paper towels to create a nice dimensional shape. I do not remove the paper towels from under the ears until the cake is on the dessert table. It acts as a fail-safe during the commute, not sure if it helps or not.... but it makes me feel better during the drive! The same rule applies to the polka dot bow on her head. Isn't it it adorable? I rolled out a thin strip of fondant, and added white polka dots to it. I gently rolled over the "ribbon" again with my rolling pin to make sure the polka dots are attached and flattened. I then creased and folded the bow over rolled paper towels to created the billowy shape. 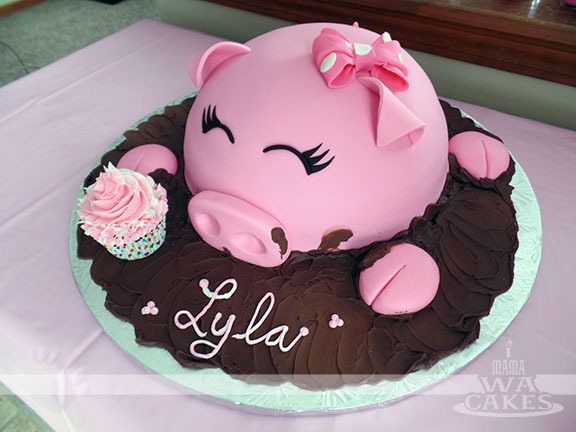 The smiling eyes were created with black fondant strips, and curved triangles for the lashes. For the curly tail, I rolled out a tapering log and curled it on itself. I let this set for a few hours prior to attaching it to the back of the cake. Last but not least, no piggy would be complete without a mud bath! This one preferred whipped chocolate buttercream, and tons of it was swirled onto the cake drum. I think she got some on her nose :) Now that is one cute piggy! 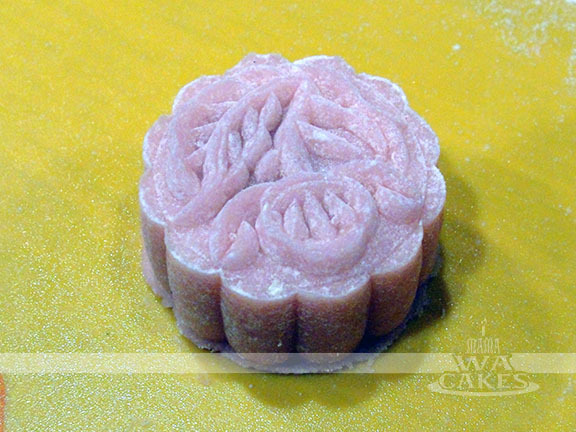 With the Chinese Mid-Autumn Festival right around the corner, I wanted to share this tutorial on how to make your own Snowskin Mooncakes. 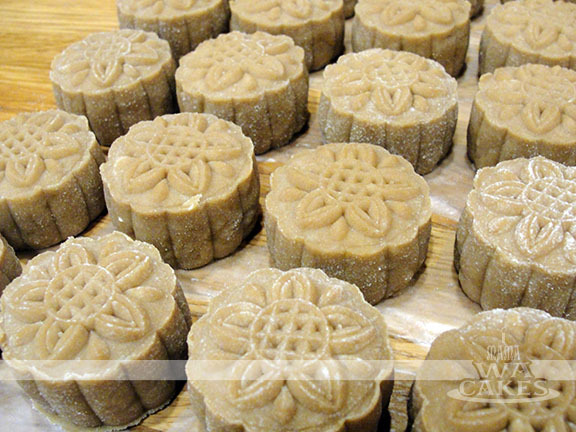 Ever since I moved into my own home, I made it a priority to buy mooncakes for my family, but they can be pricey. Last year, I decided to try making these after finding recipes online. I then tweaked it to my preference for a softer and smoother skin, with less sweetness. Usually the fillings are sweet enough without adding more to the skin. These are not baked like the traditional kind, and are tons of fun to make. They are easy to make if you can find the right ingredients, but can be time consuming. The hardest part is to find the Kou Fen, fried glutinous rice four. If this ingredient is not readily available, you can make your own and the instructions are below. Oh! and measure everything on a kitchen scale... every gram makes a difference! 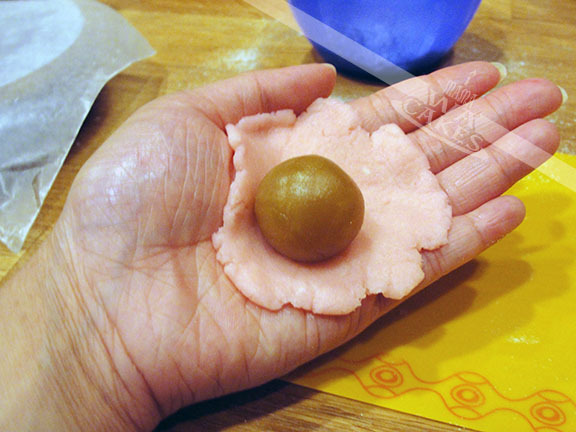 Paste of your choice for filling, such as lotus seed, red bean, taro, sesame, or chestnut. 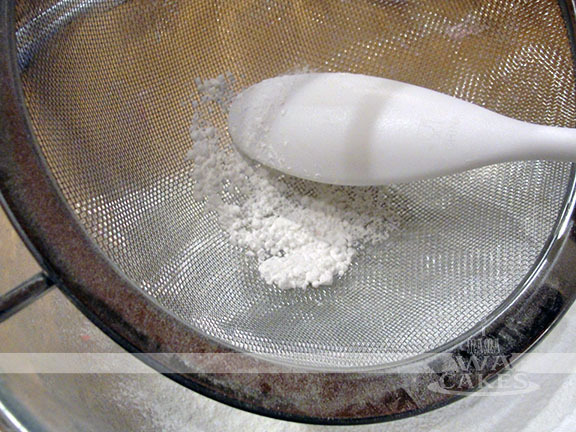 Extra fried glutinous rice flour for dusting. 1. 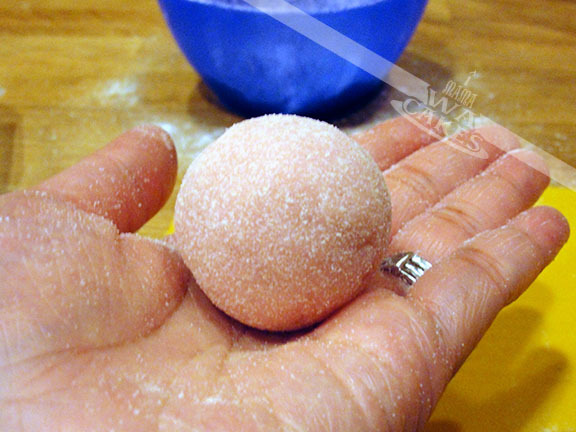 Sift together the glutinous rice flour, wheat starch and icing sugar together. Use a soon to break up clumps. 2. 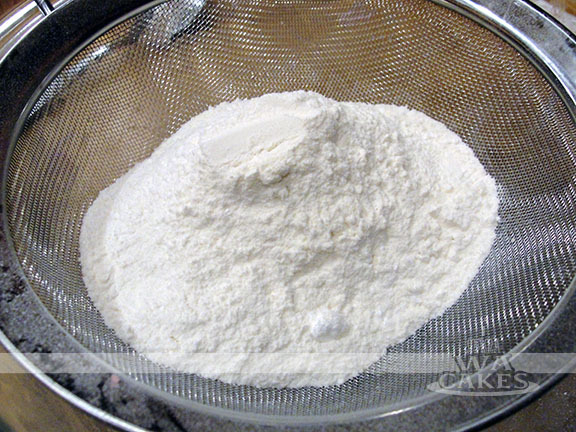 Rub the shortening into the flour mixture until it is a crumbly texture. 3. 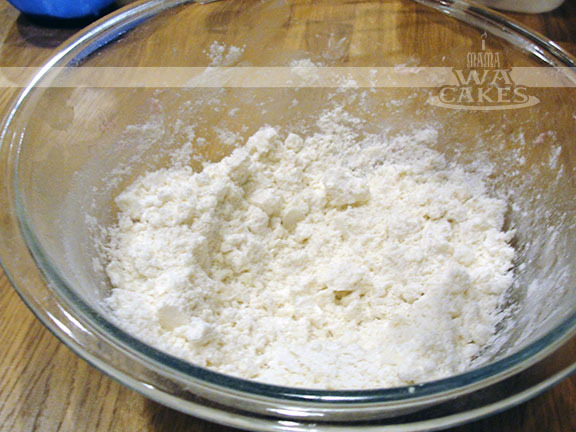 Combine water or liquid (with coloring, if using), and add to the flour. 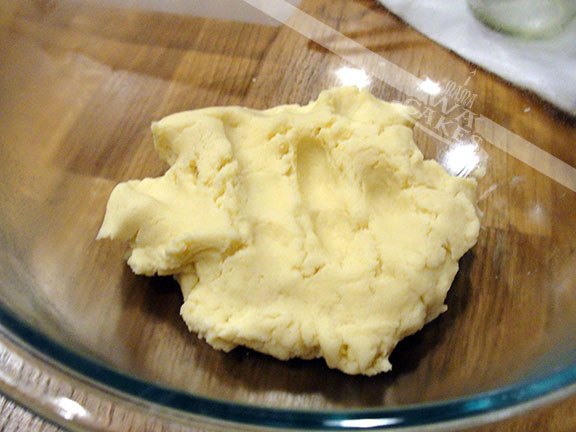 Mix until a soft dough forms and that all dry and wet ingredients are uniformly mixed. 4. Cover with plastic wrap and set to rest for 10 mins. 5. 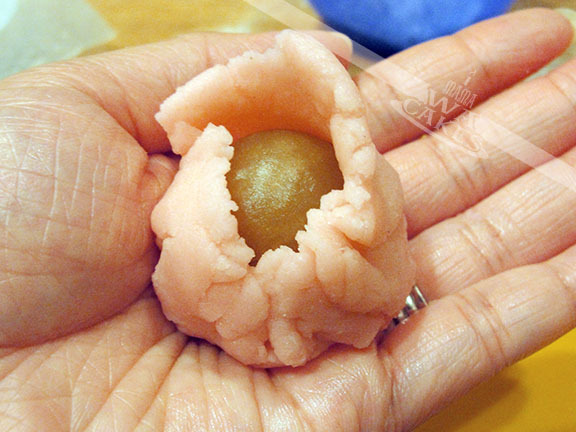 In the meantime, portion out balls of the filling depending on the size of your molds a in the ratio 1/1. 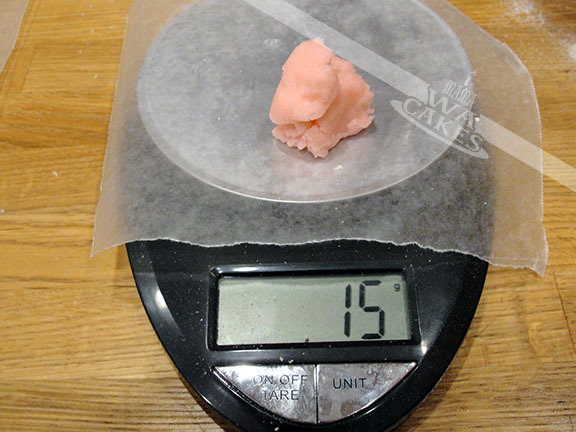 If you are using a 30g mold, ration out 15g of filling to 15g of skin dough. 6. 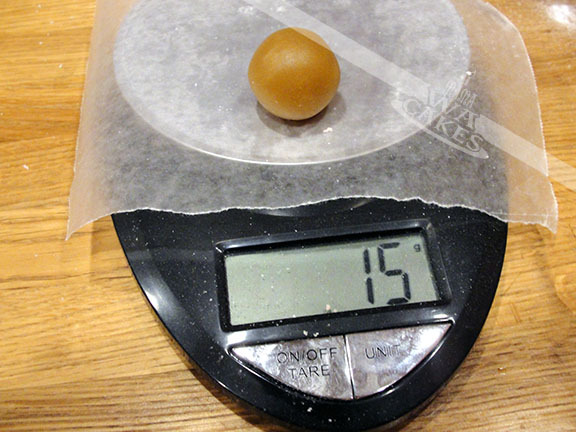 Once dough is rested, weight out the proper grams and roll into balls. 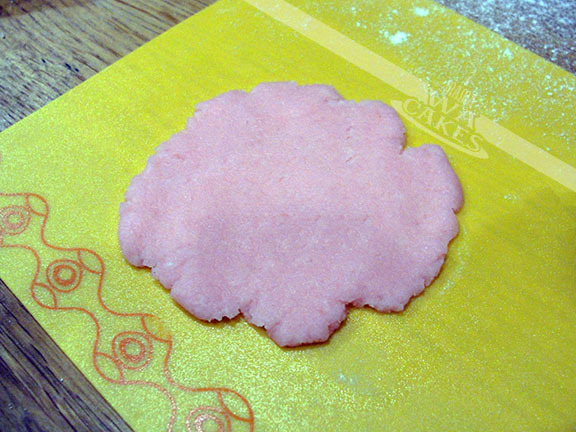 Place on clean flat surface or pastry mat and flatten with hands until a disc is formed, about 1/8" to 3/16" in thickness. 7. 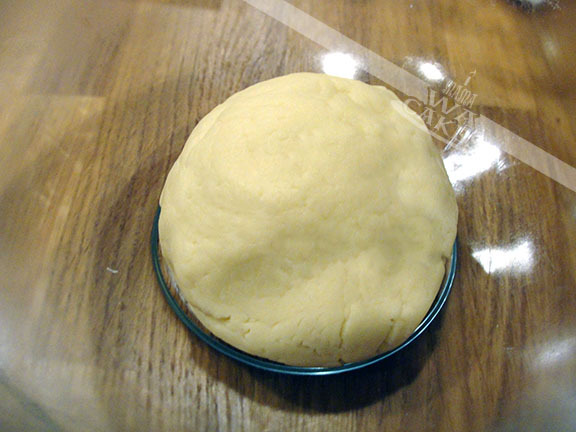 Wrap dough around filling and pinch close, dust with glutinous rice flour and roll into a ball. 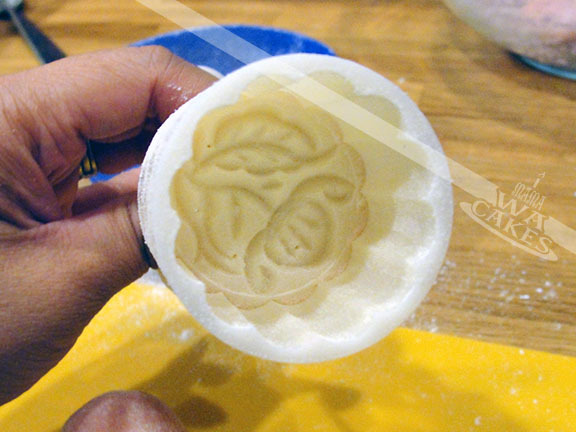 You may also dust the inside of the mold to prevent the mooncake from sticking, but make sure you shake out the extra flour. 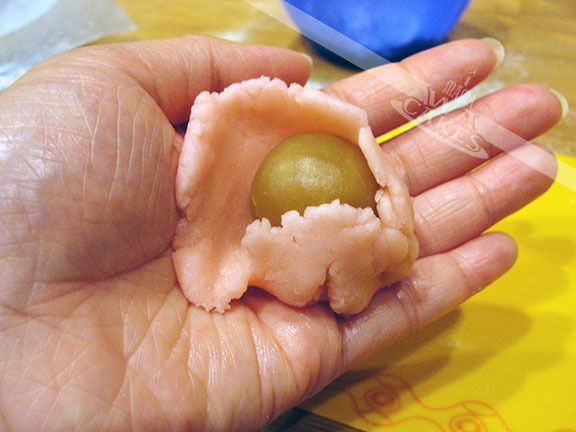 Place mooncake ball in mold and press onto flat surface. 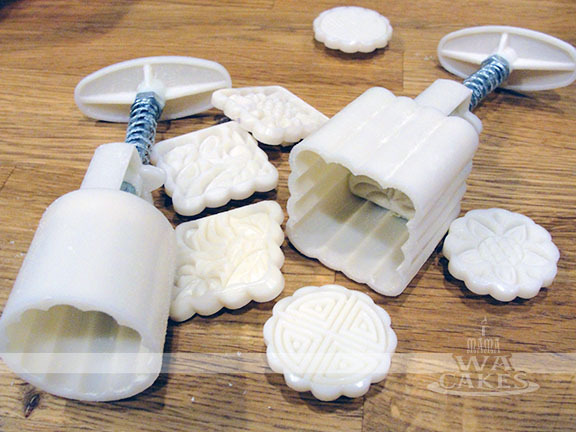 Knock it out if using traditional molds or plunge out if using the modern plastic molds. 8. Place in an airtight container and chill before enjoying! Please eat within 5 days for freshness! The end quantity highly depends on your mold. 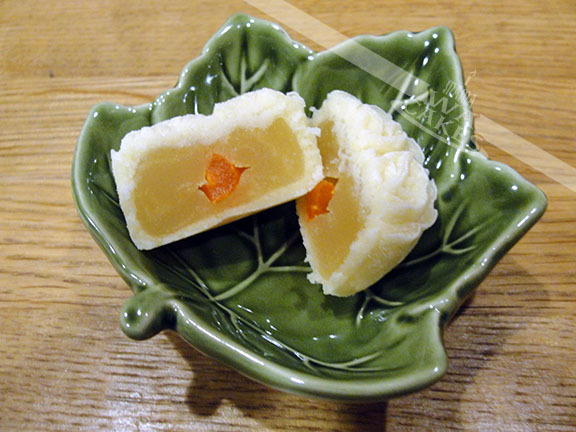 I can make 16 mini 30g mooncakes from this recipe. To prepare your own fried glutinous rice flour, cook glutinous rice flour in a dry frying pan (with no oil) until smoke is visible and flour turns slightly yellow. Remove from heat and let cool completely before using. I can't believe that Labor Day is right around the corner, and that summer is coming to an end :( This summer was full of surprises, adventures, and lots of love in the air! 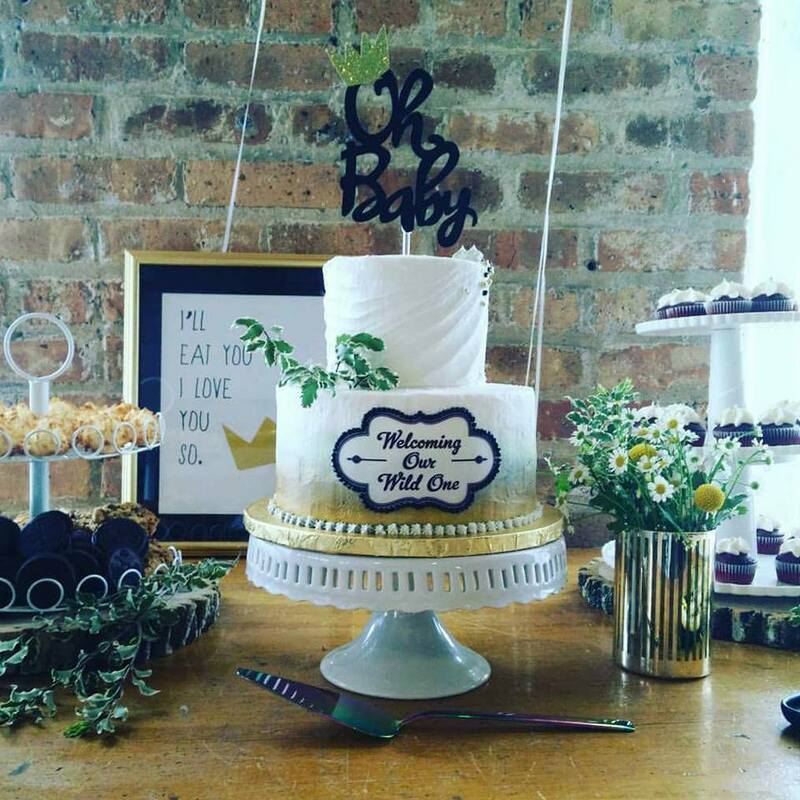 I was lucky enough to not only attend two wonderful weddings, but was also asked to make their wedding cakes for their special day. 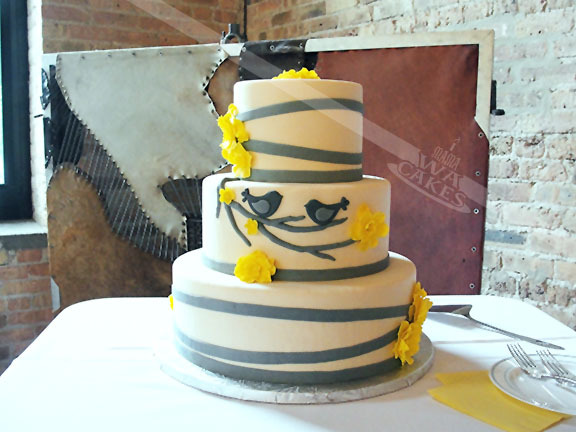 The first wedding cake was for my old friend, Laura. We met back in early 2003, and have been friends since. We used to have our weekly sushi lunches.... I'm getting hungry. She wanted something traditional, but not old fashion; modern, but not too over the top. 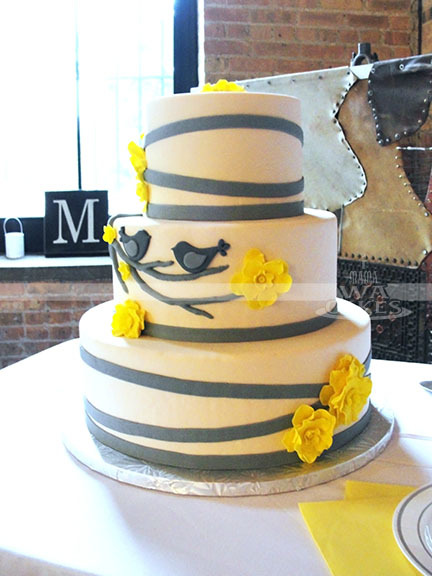 After a few exchanges of ideas, I showed her a sketch of a buttercream cake with a modern swirled finish. 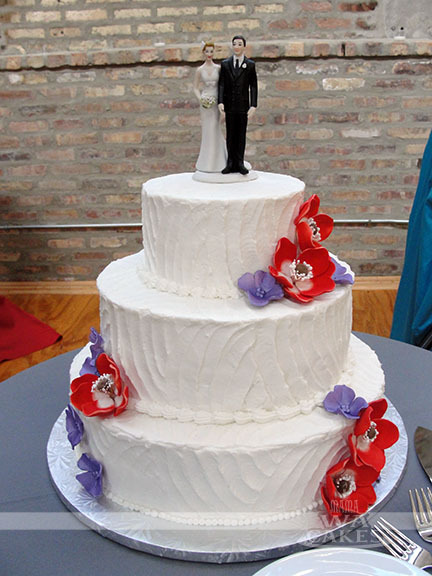 The tiers would be accented with gumpaste and royal icing flowers of her wedding colors. The cakes were torted and filled with strawberry preserve, and crumb coated. I then used a Wilton icing tip and doubled iced the cakes. To achieve the finish, I used a small angled spatula and ran it across the sides in a radiating rainbow motion, and alternating the direction as I go. Make sure to overlap over the end of previous swirls. I did this for all the tiers before stacking them. Once stacked, I piped different borders on each tier. 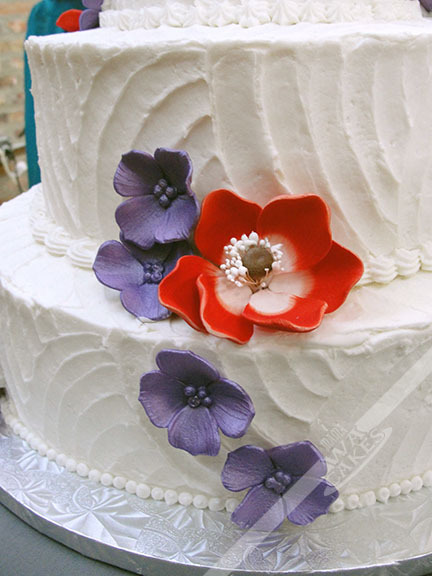 The cake was then accented with gumpaste red poppies and royal icing hydrangeas that were airbrushed with a lavender sheen for some sparkle. The second cake was for my co-worker and friend, Jenn. This cake was definitely different from any other I've made... only the top tier can be eaten! Jenn, as crazy as it may sound, is not a cake person... I know! Who doesn't love cake?! But, that didn't mean she was skimping on the sweets. She had an entire sweet table, candy buffet, and a popcorn corner! Needless to say, she didn't want to end up with tons of cake. However, she wanted one for show and a top tier for their 1st anniversary. 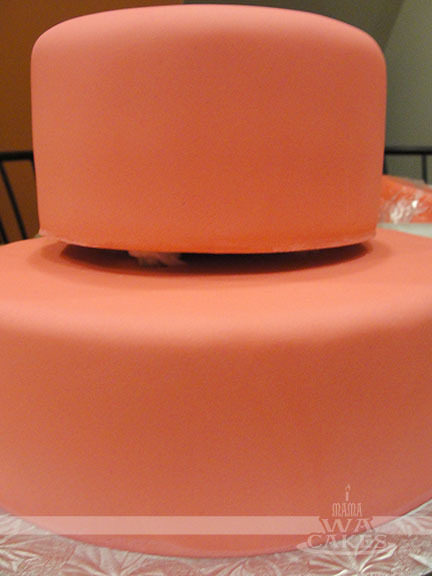 The solution was to have two large dummy layers, and a top tier of scrumptious cake made with pink muscato champagne. 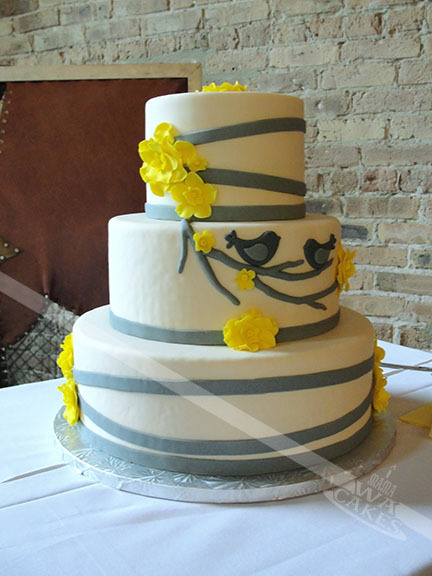 We looked through the internet for inspiration, and we decided on a white base with ribbons of grey fondant. 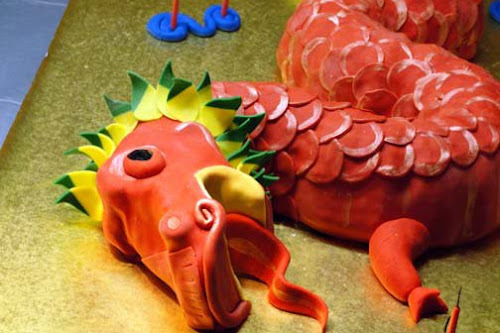 The pop of color came from the fantasy yellow flowers that were shaped from gumpaste. No wedding could be complete without lovebirds! The dummy cake layers were first prepped for the fondant by rounding the super sharp corners. 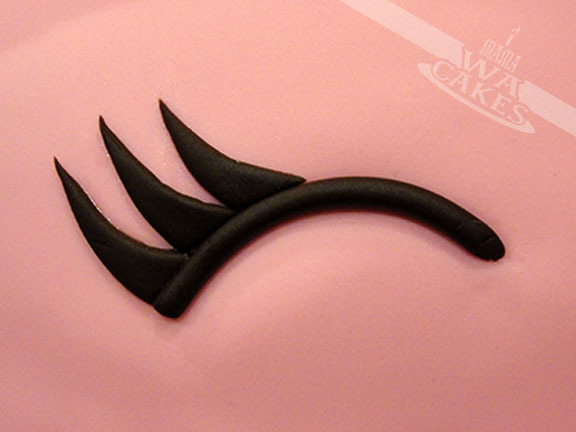 I trimmed the corners with an blade to prevent them from tearing into the fondant. They were then misted with water, and then covered. The bottom layer was attached to the cake drum with skewers that I measured and trimmed. I just hammered it through the covered dummy cake until it hit the drum. 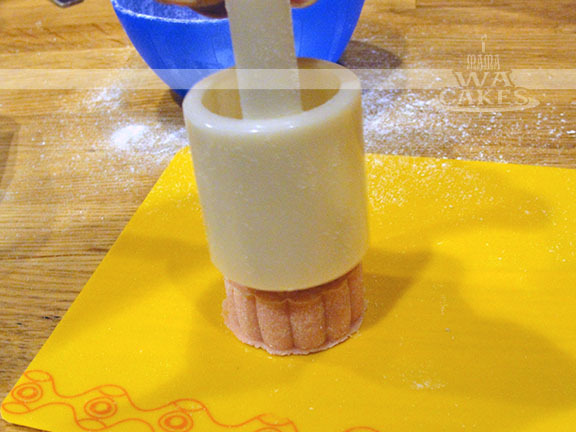 The middle dummy cake was then attached to the bottom dummy with the same skewer method, except it didn't have reach the cake drum. The top cake tier was torted and filled with champagne buttercream. I cumb coated the cake and covered it in white fondant. 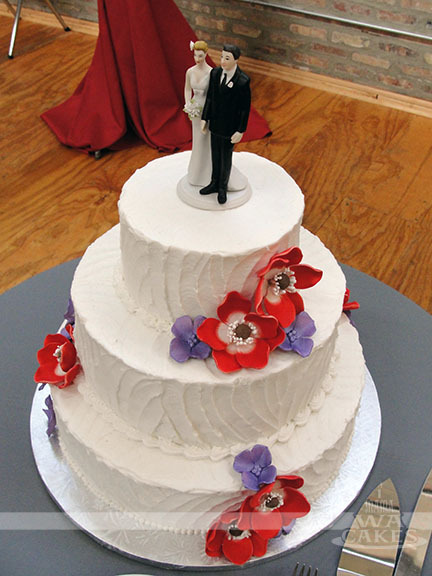 The bottom and top tiers were then decorated in the same matter, with winding ribbons of grey. The middle was the canvas to a blossoming tree branch where the lovebirds perched. Due to the top heaviness of the cake (dummy cakes are really light), it is much safer to attach the top tier (which is much heavier) onsite. I simply placed it on top of the dummy layers and attached it with buttercream. Congrats again to the two couples!!!! 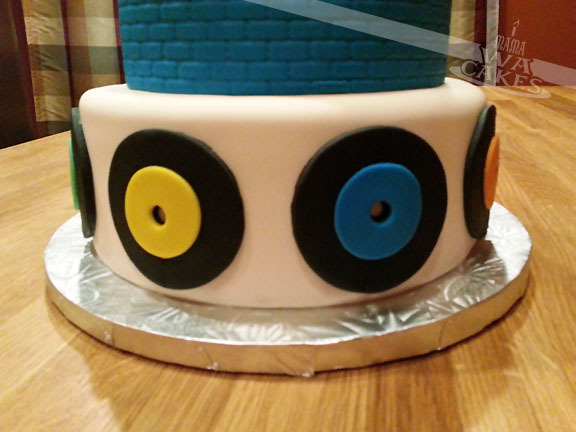 A while back, I was asked by a friend if I could make a birthday cake for her fellow 45 vinyl enthusiast, Kevin. 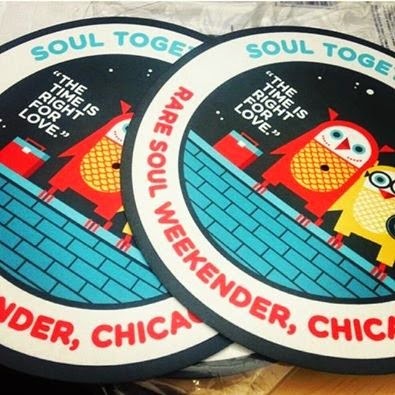 Kevin has recently introduced Soul Togetherness to Chicago, a weekend festival that brought in an international cast of DJs, and collectors of rare obscure American soul music, all on original 45rpm vinyl. His birthday coincided with the festival, so naturally, she asked that the cake resemble their logo... no problem! The cake started out with two 8" rounds and 2 6" rounds of spiced chocolate cake. These were torted and filled with a rich, buttery cinnamon buttercream. There is something magical about that combination of sweet and heat. The top tier was covered in fondant panels that I imprinted with a brick pattern, and covered the top with a circle of fondant with the same imprints. The bottom tier was covered in white fondant, and accented with mini 45s that I had cut out using round cookie cutters and icing tips. 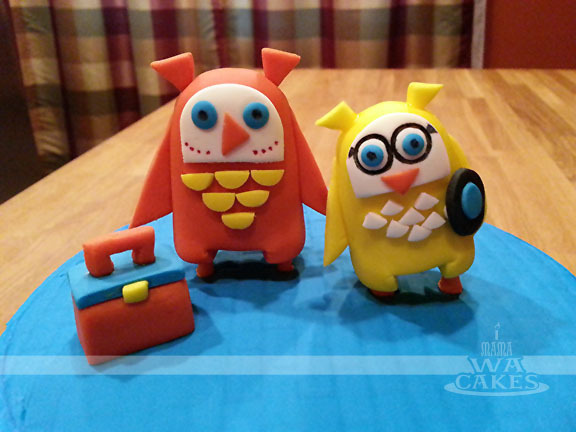 The cake was then topped off with sugar figures of the owls and record box that I had made a day ahead. The owls' bodies were shaped by making flattened logs, with one end rounded. The other end was cut with a knife to create the legs and lower half. Skewers were used for the legs, and covered in a thin sheet of fondant. 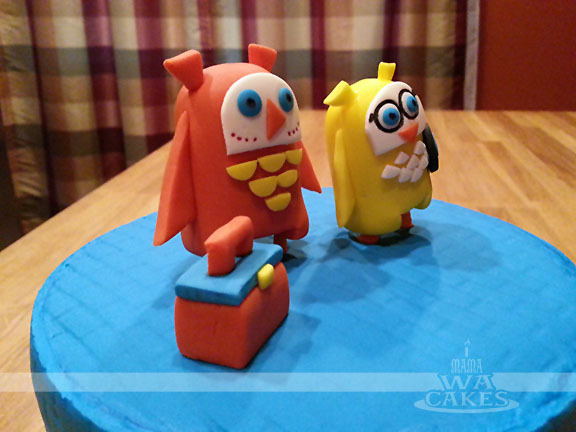 I left the skewers long so I could insert the owls into the cake. The wings and ears were cut and attached with a touch of water. A tip for details like these is to poke or create an indent for the piece to sit into with a veining tool. I then carefully ( and tediously ) added the eyes and chest details. Small details such as the pupils, freckles, and glasses rim were drawn on with edible markers. Looking at the poster, I think I did pretty well! What do you think? Recently, I received an email from Jessica! Okay, so I received an email from her.... big deal, right? Yes, it is! Let me run a little back story here. About 2 years ago, I made a cake for a friend of a friend. That was the first time I was going outside of my normal circle, and I was super nervous. It was a cake for her niece's first birthday, and I really wanted to impress them. 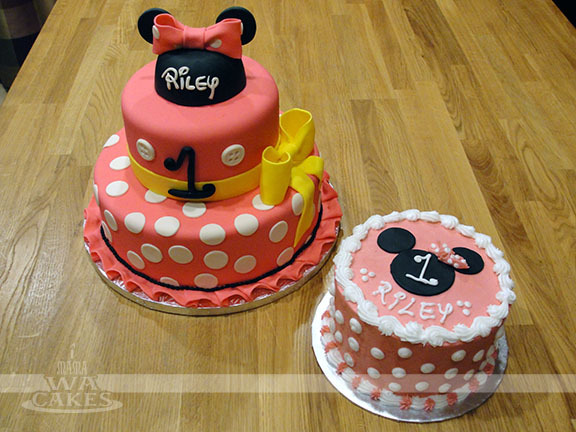 I designed a wonderful Strawberry Shortcake themed cake, and a smash cake to match. When I emailed to follow up, I didn't get a response. That left me a little worried, and I ran through a billion scenarios in my head. The thought of them not liking the cake lingered in my mind for almost 2 years! Now, you see why this email was such a big deal? Well, it turns out that they loved it and were hoping I would help with her other niece's first birthday cake... My first Minnie Mouse Cake! To start, I created the signature mouse hat by covering a small spice bowl with black fondant that I had added tylose to. 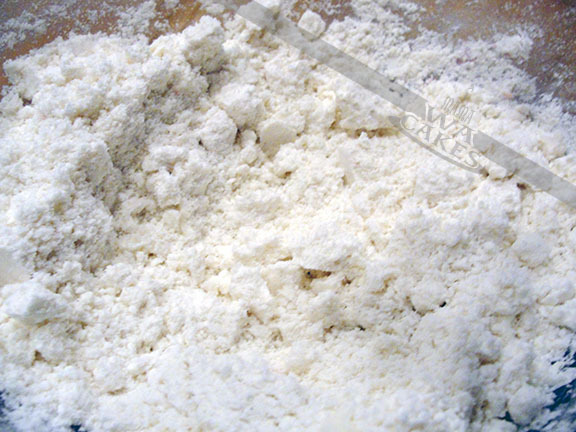 A pinch of this powder will allow the fondant to dry like gumpaste. This is a great tool to have when working with dark colors... no need for mixing the color when there is ready made fondant! I allowed that to dry completely before carefully removing the hat part from the bowl. A great is to cover the outside of the bowl with cornstarch or powder sugar so the fondant won't stick. I then added the ears and a pretty pink bow. 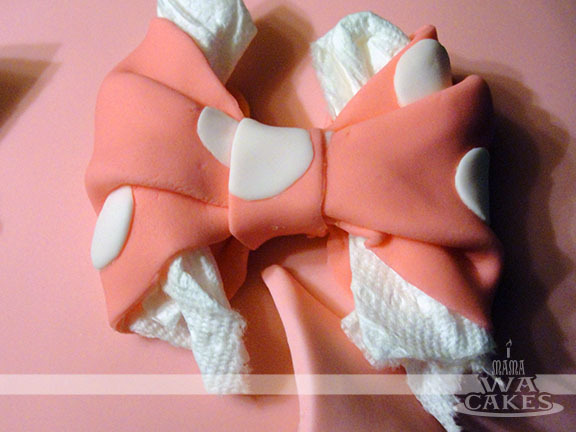 To give the bow a nice full shape, I stuffed a bit of tissue inside the loops and left them until they dried completely. 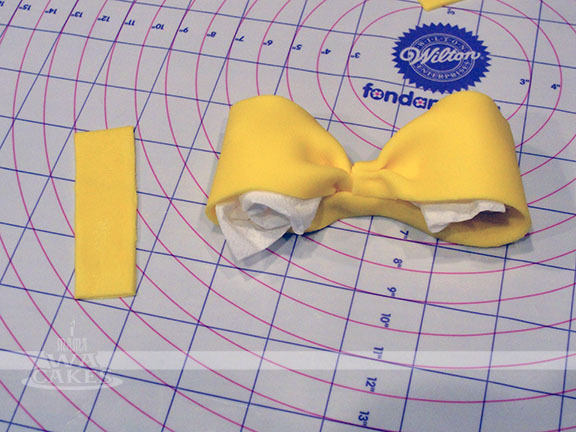 The same method was also used to create the yellow accent bow on the cake. I rolled out a long wide strip of fondant and pinch the center, folded in the loops and pinched again to meet at the center. A narrow strip then was wrapped around the center to finish the bow. Once again, I left the tissue in the loops until it dried to give it fullness. And on to the main cake! I started with a 10 inch cake that had a layer of yellow, and a layer of rich chocolate cake. The layers were torted and filled with a sweet and tangy strawberry cream cheese filling. The top 6 inch cake were two layers of chocolate nestled around a cloud of decadent coconut flakes and cream. 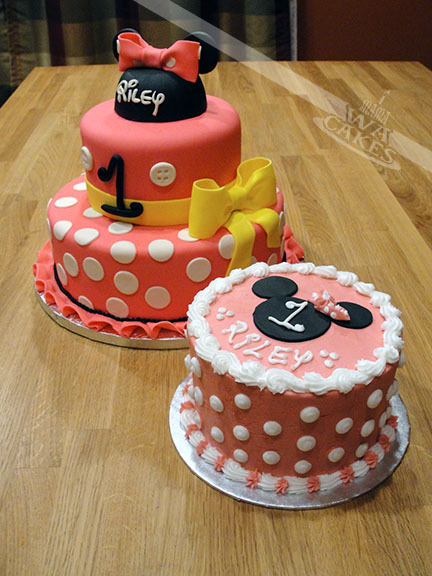 The two cakes were crumb coated before they received a blanket of smooth pink fondant. 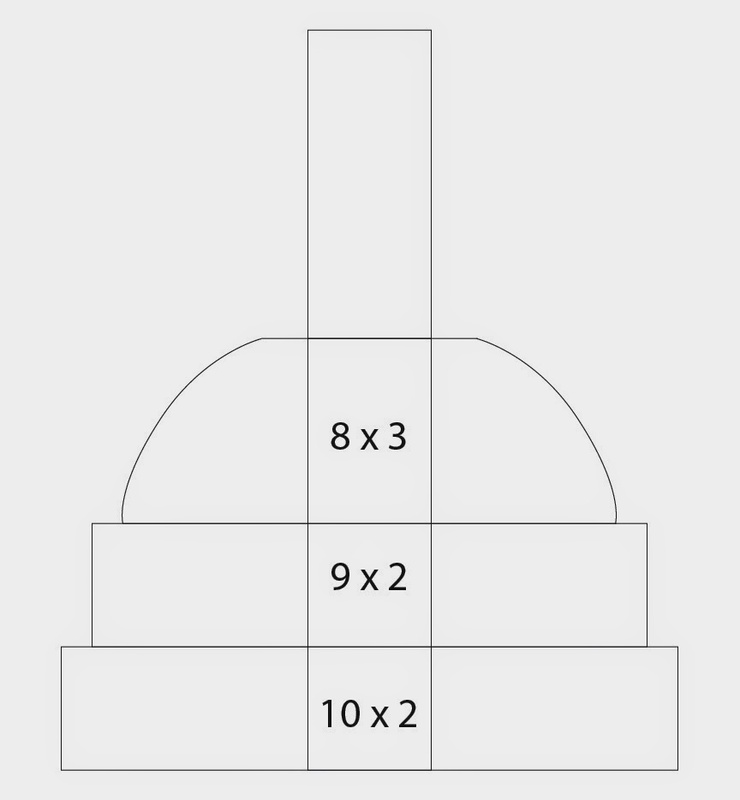 To stack the the two cakes, I figured out the center of my cakes and measured the height of my base cake. 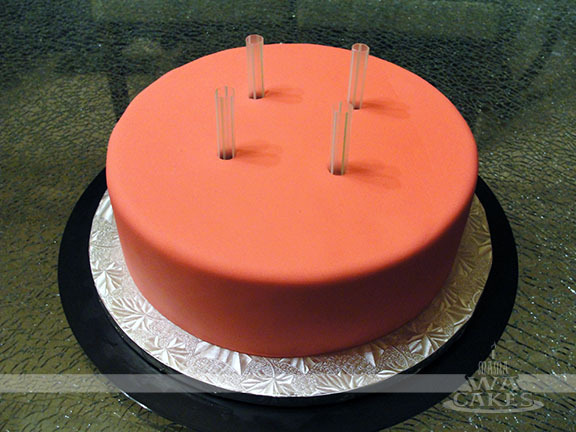 I cut bubble straws to the proper height, and carefully inserted them half way into the cake. 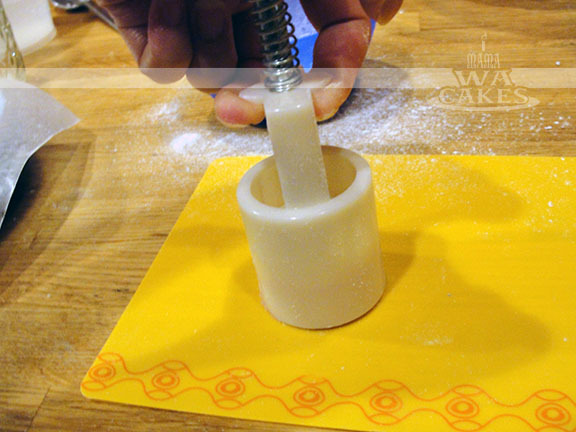 This is a trick I used to keep my cakes clean, and gives me time to adjust my placement if need be. I pipe a dollop of buttercream at the top of the straws, and align my top cake. I carefully release the cake, and allow it's weight to lower itself on to the base cake. This works great with buttercream cakes too! No buttercream covered fingers or gouged tops. 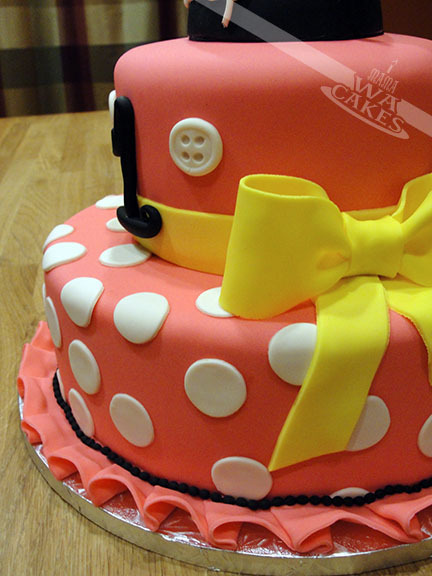 Once the cakes were stacked, I added a ribbon of yellow around the bottom of the 6 inch, and a random pattern of white polka dots were attached with a little water. The yellow bow was then attached off center, with a flow of ribbon sitting below it. 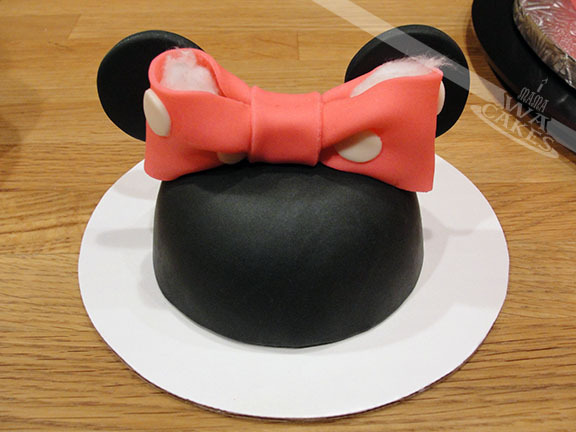 The Minnie Mouse hat was then attached to the top with a bit of clear piping gel. Be careful when doing this because piping gel will dry shiny. 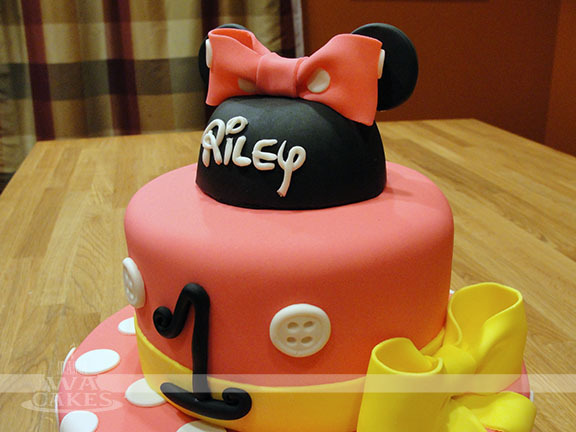 For the finishing touches, I hand shaped Riley's name in the signature Walt Disney font and added it to the hat. I was extremely happy with how the font turned out, being a type freak and all :) I then molded two white buttons to resemble those Minnie's dress, and a whimsical number 1 for the birthday girl. 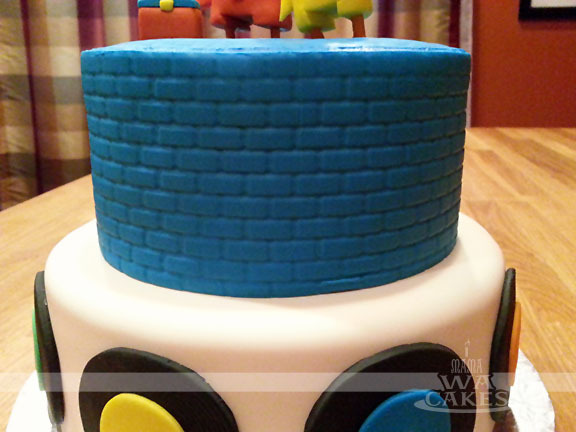 The smash cake designed with the same visual elements in mind to tie it all together. I started with a 6 inch vanilla cake filled with vanilla buttercream. The small stack of goodness was then covered in pink buttercream, and decorated with white polk dots and shell borders. 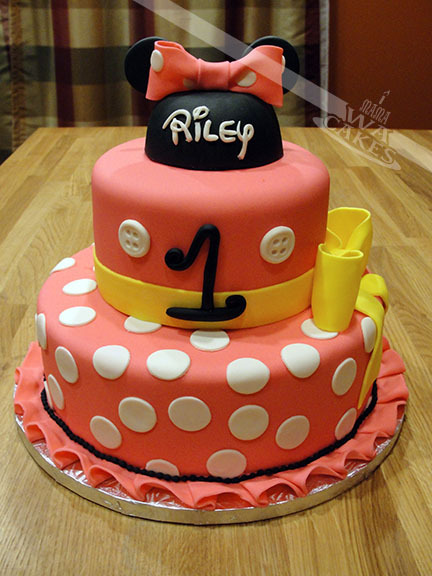 I then cut out the mouse silhouette out of black fondant, and piped a pink and white polka dot bow to match the topper of the main cake. 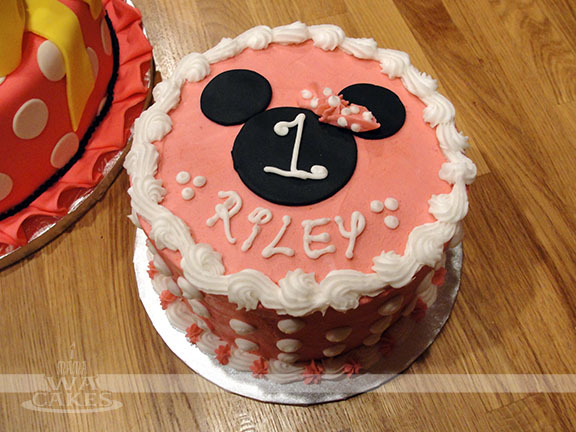 To make it complete, I piped the same whimsical number 1, and her name in white buttercream. Happy Birthday Riley!!! !